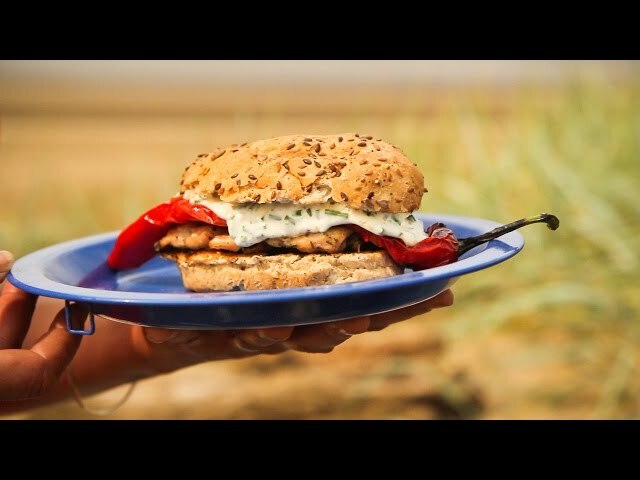 Genevieve Taylor - Herby Chicken BurgersHerby Chicken Burgers with grilled romano peppers & Lemon Mayonnaise. For your next summer barbecue, why not serve up a real break from the norm with one of our favourite BBQ chicken recipes of all time? Just a few simple ingredients are all that’s needed to whip-up the kind of healthy BBQ recipe you’ll be proud to serve to anyone! Juice, chargrilled chicken breasts with fire-roasted peppers and a zingy lemon mayo. It’s a recipe for heavenly flavour and the stuff dreamy lazy summer evenings are made of! 4 rolls - cut in half and preferably oval in shape to fit the peppers! 1. Grate off the lemon zest into a small mixing bowl. Add the mayonnaise and chives and mix together, seasoning to taste with salt and pepper. Spoon into a tub with a tight fitting lid and chill until needed. 2. Place a large food bag into a mixing bowl. Slash the chicken thigh fillets deeply but not all the way through to help the marinade soak in and drop into the bag. Squeeze the lemon into the bag with the chicken. Add the olive oil, garlic and herbs, and a generous grind of black pepper. Seal up the bag tight, squish it to mix the ingredients together more evenly and then store in the fridge to marinate overnight. 1. Fire up both burners of the BBQ and leave to heat up for 10 minutes. 2. Turn the heat down on one side to medium. Using tongs, spread out the chicken over this side of the barbecue and cook for about 15-20 minutes depending on the thickness of the fillets. Turn over occasionally so they cook and crisp evenly. Use a knife and fork to cut one open at the thickest part to check it’s cooked through. 3. At the same time you start to cook the chicken, lay the whole peppers over the other burner with the heat on high, turning occasionally until they are chargrilled all over. At this point close the lid; it will create an oven-like effect which will allow the food to cook evenly all the way through. 4. Once the chicken and peppers are cooked, push them to one side of your barbecue with the burner turned off. On the other side and with that burner turned on low, place the rolls, cut side down, to toast for 1-2 minutes. 5. To serve, add a couple of pieces of chicken to each roll and top with a pepper. Add a dollop of the lemon and chive mayonnaise and tuck in whilst hot.